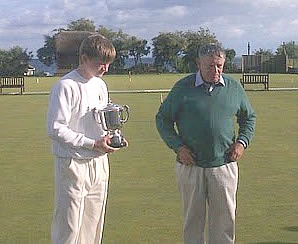 The finals of The All England Handicap, played at the Sidmouth Croquet Club on the weekend of the 17th and 18th September, were won in impressive fashion by fourteen year-old Adam Swinton from Bowdon. On Saturday sixteen competitors from four Area Finals, with handicaps ranging from scratch to 20, played in 4 blocks of All Play All, Full Bisque Play to Base 10. A combination of very good lawns and positive play resulted in most games finishing within the 3 hour time limit. Three of the blocks had outright winners: Andy Brandwood (20), Bury; Jamie Angus (7), Sussex County; and Adam Swinton (14), Bowdon. The remaining block was won by Alan Clark (11) from Watford as a result of his narrow win over Dyffryn’s Peter Balchin (12). In addition to the semi-finals and final on Sunday all players played to determine placings. In the semi-finals Andy Brandwood beat Alan Clark +4 and Adam Swinton beat Jamie Angus +18. The final was a repeat of the North West Area Final between Adam and Andy. After a close early battle, the very talented and well-coached teenager’s greater experience came through and he won + 11 on time. But considering Andy had only been playing a few months and had played just a handful of competitive games before this event, his play throughout the weekend was most impressive. Without doubt, both finalists showed a great deal of promise and should enjoy much future success. The All England Area Finals was played over the weekend of Saturday 3rd and Sunday 4th September. 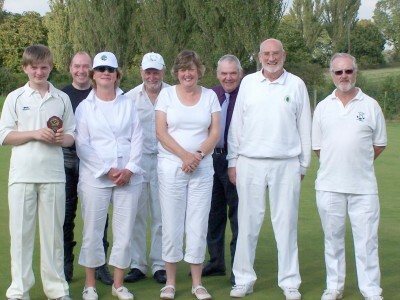 Eight contestants, all of whom had won their places in their clubs’ internal competitions played during the season, competed for the honour of representing the North West in the finals in Sidmouth, Devon in a fortnight’s time. The number of players from any club depends on how many entered the internal competitions, bigger clubs able to enter more players, thus Bowdon fielded 4 players, Bury 2, Fylde 1 and Pendle 1. There were 6 men and 2 women and competition was keen. The weather was unkind on the Saturday with all players getting a drenching but on Sunday things changed and a beautiful warm, sunny day made the lawns play faster and cheered the players. The competition is to be one of the top three in the final result. In the end Adam Swinton from Bowdon came top with 4 wins from 5 matches, three players tied for the other 2 places each winning 3 of their 5 games: Andy Broadwood from Bury, Barrie Mckenzie from Bowdon and Robin Delves from Pendle. Robin just missed out on the points scored so he will take no further part this year. The others travel to Sidmouth to compete with other regional finalists on 17th and 18th September. Youth conquered all here, the overall winner, Adam Swinton (extreme left in picture) is just 14 years old. A great prospect for the future.